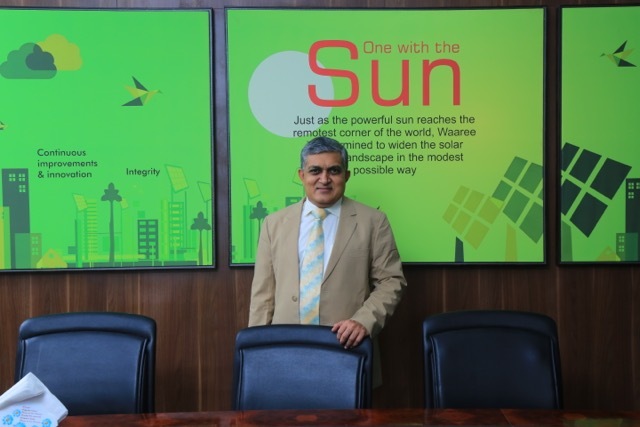 Hitesh Doshi is the Chairman and Managing Director of Waaree Energies Ltd(WEL), India’s No.1 Solar Panel manufacturer and Solution provider. He holds a vast experience of over 25 years in strategizing, leading and mentoring Business Ideas. As a self-made man, with extraordinary entrepreneurial skills, he started the Waaree Group in 1989 with a very small investment. He plays a pivotal role in growing business of the company and expanding it globally. He is driven by the idea of making the solar manufacturing solutions affordable for common man, even in the remotest areas of the globe. He ventured into the Solar business in 2007, when the solar industry in India was in the nascent stage. He met with tough challenges in terms of high technology costs and there were very few business players who were inclined to share the technology, affecting the growth of the company. Despite all the odds, the company tops the solar panel manufacturing space, thanks to his perseverance to accomplish tough targets. Under his leadership company has won many awards and honours in various categories. As an active philanthropist, Hitesh has contributed to the betterment of the society in many ways. He contributes to various philanthropical works in India, particularly in Education. He benevolently educates children in villages. He is also is involved in various social activities – Supports more than 5000 students every year for education financially, mentoring, and providing hostels facilities, for the last more than 10 years. He benevolently educates unprivileged children in villages as his contribution to the society. He likes to spend quality time with family. He likes to read autobiographies and motivational books in his free time.